When things start looking a little meagre in the list-building world, it's probably time to start shaking things up a little…with new email list building ideas. Don't limit yourself to the been-there-done-that strategies; be brave enough to branch out into untested waters. 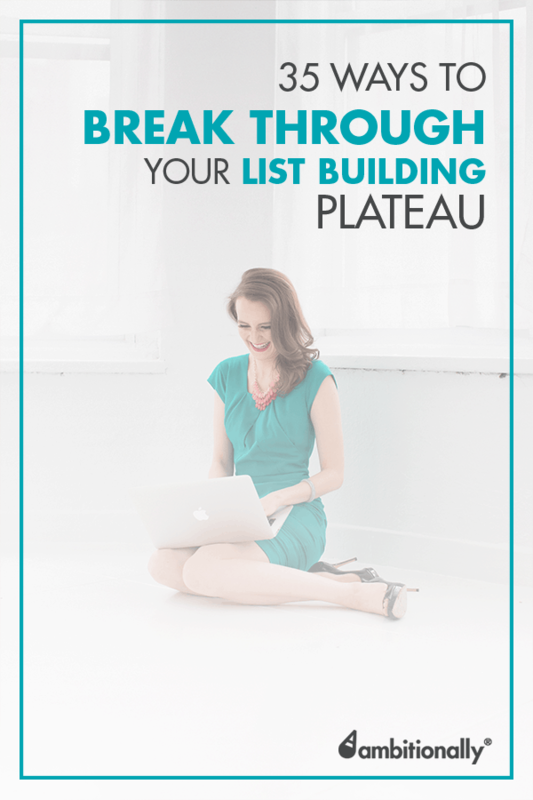 If you're in the middle of an email list building plateau, here are 35 ways to break out of it and ramp up your email list opt-ins and sales. 22. Dedicate 90 days to your email list building efforts and track your results – what you measure improves! Social media can be one of the most fruitful ways to really interact with your tribe of people. Running a social media challenge can tap into this power and get people really excited about your offer. Whether you decide to post daily challenges on your business page or create an entirely new group for the challenge, the important thing is that you harness the excitement and energy of social media…and use it to build up your list! Facebook ads are one of my favorite methods of driving traffic to my latest offers…but have you ever run an ad to your opt-in offer? You might not earn back the cost per lead immediately with this method, but you'll definitely gain some amazing new subscribers that can be converted through your autoresponder series. Do you have something great to offer to your ideal clients? Run a contest! A free lead generation contest is a giveaway where you ask people to opt-in as their entry to win something. It's a great way to gather some really enthusiastic leads: How To Grow Your Email List By Running A Contest. Tip: Establish a strong follow up email sequence when the contest winner is announced to engage the subscribers who were just in it to win. The big question is: Do popups work, and should you use them to build your email list? Installing the right popup for your website takes advantage of some of the prime-time moments that make the difference between an exiting visitor and a new lead for your site. Our WordPress plugin PopupAlly Pro is definitely one of the top choices if you're looking for a customizable, mobile-friendly, polite popup to increase your email list opt ins! If your opt-ins have just dried up (or weren't there in the first place), the problem might lie in the opt-in offer itself. Create something completely new and super helpful for your audience to get them really excited about the treasures you have to offer through your email list. You've been driving traffic to squeeze pages ever since you learned what lead generation was all about. Sometimes, though, it's better to go against the grain and do the opposite with a reverse opt in. Instead of sending people to a squeeze page where the only option is to opt in or leave, you hand out your opt in content (eBook, video series, etc.) for free – no email required. It might sound counterintuitive, but sometimes a reverse opt in is the best way to encourage other people to share your offer. Those who are impressed will be knocking on your door for more! Guest blogging takes a little bit of skill and analysis, and a lot of straight-up bold courage. But as entrepreneurs, that's totally where we shine! Don't be afraid to reach out and pitch a guest post to other sites to get in front of the people you'd like to have on your email list. How do you know if your opt-ins or landing pages are fully optimized for conversions? Set up a split test that compares one style or content strategy with another. The A/B testing option available with PopupAlly Pro is probably one of the easier ways to start this test. One of the greatest list-building efforts I've ever pulled off is the 30 Day List Building Challenge. It's packed full of information, easy-to-digest, and gets people inside our membership site…for free! And since our membership site offers an array of upsell and downsell opportunities, it keeps the new subscribers engaged and excited about our stuff. If you're looking for a list-building boost but don't have the time to spend writing massive amounts of content, then it's time to host a webinar! To increase your visibility in one segment of your target market, focus on just one targeted keyword and improve your rankings for it. If you're not showing up on the first page of search engine results, you're probably not being seen at all. What happens to people who visited your site but never opted in? One way to reach out to these people is through Facebook retargeting ads. They can be really effective in sweeping up those “missed opportunities” and getting them to opt into your email list. There's no need to get controversial … or is there? Tapping into controversy is a great “notice me” tool because it really does get people's attention. Those who ignored your posts and ads in the past are now drawn to your strong opinions and well-thought-out explanations. But the great thing for you is that you don't have to get “mean” about it. Sometimes, tapping into controversy can be as simple as a blog post called: 50 List Building Strategies We Can Learn From 50 Shades of Grey. YouTube videos have the potential to attract thousands of people to your business. If you have some old videos that are still applicable (or new ones that are just being created), take the time to optimize them for a popular keyword. Use this keyword in the video title and description, and don't forget to link back to your website! Participate in Facebook groups that are complementary to your business. It's an easy way to gain some visibility, share your knowledge and insight, and naturally lead people back to your opt-in. Warning: don't use this participation as a self-promotion medium. People sniff that out right away and you lose all credibility. Instead, offer helpful responses and only include a link back to your opt-in when it organically fits and will really solve the questions that are coming up. Joint venture webinars are a great way to tap into someone else's strength and increase your email list subscribers from their established tribe. It's fun, mutually beneficial, and a great way to foster a mutually beneficial business partnership along the way! Setting up an affiliate partnership program is another way to tap into someone else's audience. In a well-built affiliate program, you provide the incentive and tools so that your affiliates can market your business and bring in some extra subscribers and cash flow. Depending on your niche market, Pinterest can really be one of the most powerful modes of social sharing. When we started adding images that were specifically designed for Pinterest to our blog content, we experienced a huge boost in shares and visits to our site. To get started on designing images that will perform well on Pinterest, check out this article by CoSchedule: How to Make the Best Social Images The Easy Way. If you're looking to bring in more opt-ins, don't be afraid to pitch yourself to be interviewed on someone else's podcast. Pitching yourself can be really uncomfortable at first, but learning how to gracefully reach out to other influencers and offer your services is a great way to build up your professional relationships…and increase your opt-ins at the same time. A well-crafted autoresponder sequence is the key between good conversion rates and your email list. Taking the time to set up your funnel properly will increase your conversion rates and decrease the amount of time you have to spend on acquiring new leads. Need a little help? Check out our article on: How To Write An Effective Autoresponder Series. Whether or not writing is your forte, guest blogging is a great way to get more inbound links to the high-quality posts on your site. Take the time to share your expertise and, if needed, ask a good writer to edit your blog before you send it out. Learning how to start guest blogging is definitely a great skill to have as a business owner! It's a well-documented phenomenon that whatever you measure, improves. That having been said, make a point of focusing on your list building efforts for 90 days. Keep track of what's working and what's not, and you'll begin to discover the most effective way to reach your audience. Maybe you're big into Facebook, but haven't tapped into Pinterest yet…or maybe you've been going all-in on guest blogging, and haven't made a single podcast episode. Whatever the case may be, introducing your opt-in offers into new verticals that might not have heard of you before is key to finding new paths towards list-building success. Keep in mind that not all venues work for everyone; there's a reason why I stopped my weekly video show and invested in other areas, instead. Craving to get in front of some more people and make a little money on the side? Publish a book on Kindle! Within this book you can link back to your opt-in offers pretty prominently, ensuring that the people who love your work will opt to stay with you for the long haul. Blog syndication simply means that you're republishing content that's already appeared on your blog. One good place to begin experimenting with blog syndication is on a website called Medium. Typically, the “duplicate content” issue of SEO doesn't really come into play when you republish content – but definitely be sure to include links back to your main website. Those who like what they read on Medium will be happy to click through! Reaching out to other influencers in your industry is a great way to increase the reach of your very best web content. Tip: If you mention or showcase an influencer in your amazing blog post, you provide them with a little more incentive to send out a few social shares about it. Have you ever written a blog post only to realize that there's so much more you have to say on the topic? A content upgrade is a great way to add that information and increase your opt ins at the same time. After you write your blog post, add some additional content that people can opt in for and download, like a checklist, printable, etc. Give them a reason to opt-in at the end of each post. Launches are an intense, focused period that can really bring in some revenue and new subscribers for your email list. They can rally your audience and get them to help spread the word for you. If you're thinking about going this route, be prepared for some crazy awesomeness along the way! Here are some of the lesser-known aspects of an online launch: 38 Things No One Talks About When Launching An Online Course. Guest appearances are almost always beneficial, but why stop at guest posts and podcast interviews? Join in on the buzz surrounding other people's social media accounts, whether that means Instagram, Facebook, Periscope, or another platform. It's original and effective for getting in front of your next email list opt-in. Social media and email surveys are two of the best ways to get valuable input from your ideal tribe. Set up a quick survey or poll, and let your audience brainstorm the next product they want you to create for them. The best thing is that you already know this new product will be exactly what they're looking for! Invest in high quality, professional design or improve the production value of the offers and content you've been putting out there. It's just one more way to make your offers pop and attract new qualified opt-ins for your email list building endeavors. Paid advertising can be a beast to budget for. One way to counter this issue is by creating an evergreen funnel that's designed to cover the cost of your ads. As this evergreen funnel continues to bring in revenue, you have ready-made money that you can start using on scaling your advertising strategy. The better your ads, the more revenue you can bring in. It's a win-win. Slow and steady might win the race, but sometimes an all-out media blitz can get you the visibility and interest you need to get out of your list building plateau. Schedule a series of guest posts, interviews, and other media appearances to all take place at the same time. It'll definitely get some new names interested in your offers and email list opt-ins. When sponsoring a podcast or another popular blog platform, you'll benefit from regular mentions and increased visibility. The investment will pay off pretty well, especially if you've chosen to sponsor a platform that really lines up with your ideal audiences' interests. This can subtly and effectively set you up as an influencer in your own niche and attract others to your email list. Sometimes the best email list building ideas are the simplest. Often, you don't need to pursue the latest and greatest trend. Just find something that worked for you in the past and repeat the process – but do it 10x better this time. You can re-launch a course, a book, or a webinar multiple times and get massive returns as a result. Get going on your next list-building opportunity! I'd love to hear what's worked for you in the past (or present) – share your tips and email list building ideas in the comments below.